Our school council visited Parliament on Monday 23rd April 2018. We wanted to find out all about the Houses of Parliament and visit this historic building. Becca from the Education centre took us on a tour of the building. Some of the features we saw were: The Queen’s dressing room for when she opens parliament. Did you know that she has her own entrance to the building? We also visited the House of Commons, as well as the House of Lords. 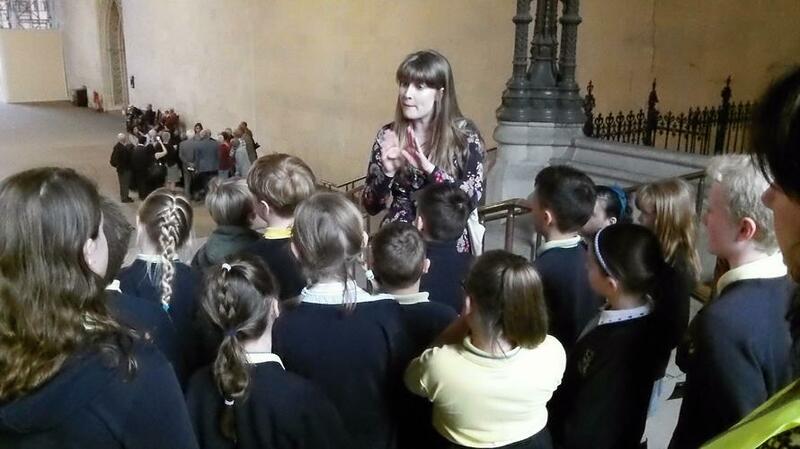 This tour was then followed by a workshop held in the Education department of Parliament. Our workshop was all about historical events that had brought about women’s rights to vote and how to use our voice when deciding upon important issues. During our visit we witnessed a couple of silent protests, which helped us see that even as adults our voices/thoughts still need to be used in order for the Government to see that not everyone is happy with their decisions. This reminded us of when we held our silent protest about the parking outside of school.